TV show dates: November 7, 2017 — January 18, 2018. Performers include: Killian Scott, Logan Marshall-Green, Sarah Jones, Chasten Harmon, Melinda Page Hamilton, Christopher Heyerdahl, Joe Adler, Teach Grant, Dan Donohue, David Haysom, Arnold Pinnock, and Rohan Mead. From creator Tony Tost, the Damnation TV show unfolds in the American heartland. The 1930s period drama centers Seth Davenport (Scott). Although he poses as a small town Iowa preacher, he is actually an incognito labor agitator. Seth’s goal is to incite an all out revolt against the status quo. Meanwhile, a captain of industry has hired professional strikebreaker Creeley Turner (Marshall-Green) to squash the insurrection ant any cost. With all his attention focused on his objective, Davenport has no idea that there is already a strikebreaker on the scene. What’s more, he and Turner have a history — one that’s dark and bloody. This saga delves into legendary conflicts involving big money and the common man, religion, greed, prophets, and pretenders. Refusing to let history repeat itself, Seth resigns to do whatever’s needed to save Amelia from the Black Legion. They already killed DL Sullivan; what’s to stop them from killing his wife? He’s not deterred, either, when Bessie and Sheriff Berryman arrive to the Riley’s farm the morning after the Legion’s attack and Bessie has some news. Unveiling the newspaper clip her father gave her at the end of the previous episode, Bessie tells Seth that the DuVall family owned Paideuma Oil, which hired Seth and Creeley’s father to clear out the land all those years ago. In other words, all the bad they’ve been through since childhood — including Cynthia’s death and Amelia’s capture — has been because of Tennyson DuVall. The news just gives Seth more incentive to set things right, and he hands over his gun to his brother and prepares to turn himself in, unarmed. “And what then?” Creeley asks. “I’m gonna stall and hope somebody figures something out,” Seth responds. Despite the ongoing tension between the siblings, Creeley does, indeed, figure something out and save Seth, but more on that in a moment. First: Here’s what happened after Seth turned himself in. Approaching the blockade of Black Legion men on the outskirts of the Riley farm, Seth is hooded, thrown in the back of a truck, and driven to the local radio station. There, he comes face to face with Martin Eggers Hyde PhD for the first time. Martin knows Seth’s true identity right away: Seth Turner, brother to Creeley, ex-strikebreaker. He knew this before, of course, but it was further confirmed with the banker John Dyson’s photograph of Creeley and Seth as young men. For reasons still unknown, Martin killed John to take the secret to his grave. The set-up from there is simple: Amelia will survive their meeting if — and only if — Seth gets live on the air and rescinds his sermons and convinces the strikers to go back to work. Amelia watches helplessly from the other side of the glass sound booth, a gun cocked, loaded, and pointed at her head. Seth agrees to do it, but requests speaking with Amelia first, who begs him not to get on air and that “they’re gonna kill us both anyway.” Before she can say much more, the Legion men flanking her put a gag in her mouth, and she’s forced to listen to whatever Seth has to say. Despite mostly keeping his dark past a secret from Amelia up until this point, Seth finally confesses to being a strikebreaker at one time himself and for having Cynthia’s blood on his hands as much as Creeley does. He also tells her that DL is dead by the hand of the Legion; Amelia looks utterly devastated. But that’s when Martin forces him to go on air and read off his pre-written script. He goes on and on, saying that to strike is a hopeless cause and immoral practice — that they find themselves in the middle of an “un-American war.” The last thing he says before being unexpectedly disrupted is “Who needs Jesus Christ when you’ve got Henry Ford?” It’s an awful affair. But before he can say anything more, Berryman, Creeley, Sam Riley Jr. and others pull up around the station and have it surrounded. A shootout ensues. In part to stop the Black Legion from taking over Holden County and also to protect Bessie, Creeley and Sheriff Berryman come together in this episode for the common good. What obviously started as a contentious relationship turns out to be mutually beneficial. This first comes to light when Martha needs to get Preston into town to see a doctor. Though it appeared he died atop his tractor during the midnight shootout, he’s found still breathing come sunrise. Creeley, Berryman, and Connie accompany Martha and Preston to town, but are abruptly brought to a halt with the Black Legion’s armed and dangerous barricade. With hardly a second thought, the three of them leave Martha and Preston in the back of the car and quickly shoot down the majority of the Legion men. Berryman spares the survivors’ lives with the condition that they leave town and never return. The scene is an impressive showcase of the trio’s skills with a firearm, but also an introductory taste of some flirtation going on between the newly reformed Connie and Berryman. Could it lead to something more? “I haven’t felt this warm inside since I saw your little jingle- jangle dance in that warehouse,” Berryman teases Creeley. The group parts ways once they’re in the town center, and that’s when Creeley finds John Doyle dead in his office. (He was going to see about persuading him to get the Black Legion to stand down.) Berryman, meanwhile, is back in his precinct with Deputy Raymond Berryman, his shamed nephew; he tasks him with deputizing and weaponizing every able-bodied man and woman in town to take down the increasingly powerful Legion. Soon enough, they’re outside the radio station where Amelia and Seth are being held captive and itching for a shootout. They wrap the standoff victoriously and free Seth and Amelia (who’s still noticeably furious and depressed about Seth’s past and DL’s death). Just two hooded Black Legion men escape, and chances are one of them is Martin Eggers Hyde. Just after the radio station shoot-up, Berryman interrupts a growing political rally for Melvin Stubbs and puts him under arrest for the kidnapping of Amelia, death of DL, and allowance of the Black Legion to rise to power in his town. Melvin laughs it off and goes willingly, assuring the crowd it’s a bit of political theatrics, but soon enough, he’s sitting with his deputy-elect Tanner Phillips and several other from his crew behind bars. Amelia watches it all unfold from afar, lighting a cigarette and vibrating with anger. She says aloud for Martha and Connie to hear that Stubbs is lucky Berryman got to him first because she would have taken pleasure in watching him burn — just as she did her husband’s killer. Despite letting Seth off the hook last week after learning that he didn’t kill her husband, Connie’s ears perk up at that: Amelia admits to chaining the strikebreaker to his own car and setting it ablaze. While it’s too early at this point to know what Connie has planned, she turns to Martha and asks her to take care of Brittany should anything ever happen to her (a request she’s honored to accept). Back at home, Amelia sits with Seth, speechless at the events of the day. “This is what I wanted: to know the truth,” she says, trying to convince herself. She’s stewing in her grief and blaming herself for DL’s death because she batted her eyes and got him swept up in their movement. It doesn’t help, either, that Stubbs was just announced the new Sheriff of Holden; he won by seven votes. Plus, she believes DuVall and her textile factory owner father are going to overtake the town. She’s helpless. “The preacher act. Our so-called marriage. It’s just a story we told ourselves so we could believe we were actually decent people,” she tells Seth, but he’s having none of it. He insists to himself believe in their message, even the preacher part. It’s all real to him. They’re interrupted then by a knock on the door from DL’s landlady, who has a manuscript of his book, “God’s Body,” to give to Amelia. It’s dedicated to her, just like he said. She finally lets herself cave to the sadness and breaks down crying. Later still, when Seth is out for the night and she’s alone at home, she’s shown reading the book and admits aloud that she’s “actually jealous” of his mind and his writing abilities. That’s when there’s another knock on the door: This time, it’s Connie. “I very much need us to talk, one widow to another,” Connie says. And that’s the last time we see either of them this season. Despite Seth and the farmers’ best efforts to get the word out at the last minute that they need to get out and vote, Berryman ultimately loses the election for Holden County Sheriff to Stubbs by seven votes. Stubbs is in his jail cell when the news reaches his desk, and Berryman at first seems to take it all in stride. He unlocks the cell door and hands over his badge and his keys. But as is often the case with Berryman, who’s established himself this season as one of the most complex characters on Damnation, not everything is as it appears. He has different motives entirely. Before leaving Stubbs to his precinct for good, Berryman wonders aloud what will come of Bessie while Stubbs is in power. The new sheriff’s deputy, Tanner, is quick to say that the “nosey whore” and Victor, the “uppity dairy farmer,” will meet their end with a tall tree and a short rope. “I suppose that’s what people are looking for these days. Men with the courage of their own convictions,” Berryman muses. When it comes to the personal and professional relations of Martin Eggers Hyde and Creeley Turner, Tennyson DuVall is the real man of power. He says what’s what and trusts that they’ll abide to his word. That’s why in the end, Martin ends up dead and Creeley is hired to take on his job. After the shootout at the radio station, DuVall comes to town to check in on the progress that Creeley has made with the strikes, which by Martin’s account to his boss, have been nothing short of astounding. Finding Creeley getting ready to leave town in Bessie’s room at the brothel, DuVall and Martin take Creeley for a little midnight drive to an open field in the middle of nowhere. The mysteries and colliding intentions and perspectives through this entire encounter don’t become clear until the very end, but turns out, DuVall is privy to the fact that Martin has been lying to him. He was grooming John Dyson to replace Martin, and before Martin killed him to silence him, DuVall got word that Martin employed the Black Legion to help end the strikes and take over the town. Once the three of them are in the middle of the field, Tennyson draws his gun and shoots Martin right in the gut. “That’s always been your worst trait, Martin. You mistake cleverness for wisdom and underestimate the intelligence of your fellow man,” Tennyson says. He goes on to say that employing the Black Legion risked his “family’s good name. We’re a family of philanthropists, art lovers, and progressive entrepreneurs, Martin. Not killers and thugs.” Tennyson shoots him dead. He then turns to Creeley, who looks rather stunned at the unexpected turn of events. He offers Creeley Martin’s job, which the former strikebreaker accepts. The season ends on Creeley returning to the brothel to find Bessie sitting on the edge of her bed crying and listening to her mother’s record. He sits beside her and holds her hand. It looks like their plan to escape Holden won’t be happening quite yet after all. And that brings us back to Seth. He was able to tell the farmers of Holden firsthand that the sermon he gave on the radio was a lie and that he was forced to make it, but only a small portion of the now-dejected farmers tuned in. Therefore, he takes to the airwaves once again to right his wrong and give the sermon he truly feels to be true. What do you think? Did you like the Damnation TV series? 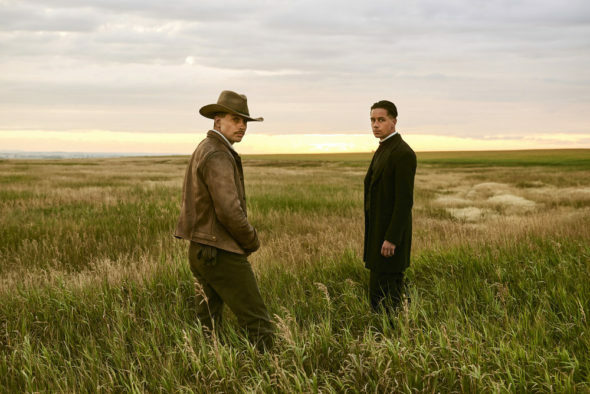 Should USA Network have cancelled or renewed Damnation for season two? I watched all 10 episodes in just 2 days and was really disappointed to discover that the show was being cancelled after only one season. It is an excellent story with fine writing and acting to go along with it. …… I really hope someone will reconsider and finish the story! I cannot believe that the show was not popular with millions of people. It will be a real shame if it is not finished.